Duma, State [Государственная дума Российской империи; Gosudarstvennaia duma Rossiiskoi imperii]. A parliament with limited powers that existed in the Russian Empire in 1906–17. The duma was established in response to the Revolution of 1905 by the tsar's manifesto of 30 October 1905, setting forth its limited legislative powers. The body was elected using the curial electoral system. Ukrainians under Russia were able to elect their own representatives in the elections to the first and second dumas. Among the elected representatives were nationally conscious Ukrainian leaders as well as ordinary peasants. 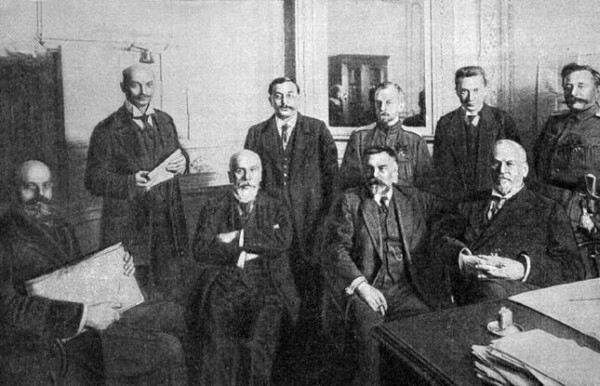 A Ukrainian caucus existed in the First Duma (10 May–21 July 1906) and Second Duma (5 March–15 June 1907) (see Ukrainian caucus in the Russian State Duma). It consisted of 44 and 47 members respectively, who eventually formed the Ukrainian Duma Hromada with its own political program. The prominent members of the Ukrainian caucus at the First Duma were Illia Shrah (leader), Pavlo Chyzhevsky, Volodymyr Shemet, Andrii Viazlov, and the peasants Mykola Onatsky, H. Zubchenko, and A. Hrabovetsky. The caucus of the Second Duma included M. Rubis, Rev A. Hrynevych, S. Nechytailo, and V. Khvist. The official publication of the caucus in the First Duma was Ukrainskii vestnik (Saint Petersburg); in the Second Duma, Ridna sprava – Dums’ki visti. Most of the Ukrainian deputies belonged at the same time to the larger caucus of non-Russian nationalities known as the Autonomists' Union. The first and second dumas were dissolved by the tsar's government. The Third Duma (1907–12) and Fourth Duma (1912–17) were elected under a different electoral system, introduced by the law of 3 June 1907. This law limited the representation of the peasantry, workers, and national minorities and favored the landowners. The majority in the dumas represented Russian conservative circles. There were few nationally conscious Ukrainians in the last two dumas, and they did not form their own caucus or representation. Ukrainian and other progressive delegates often raised questions in the dumas about such matters as the persecution of the Ukrainian press, the need for Ukrainian schools, and Russian repressions in occupied Galicia during the First World War, but their efforts were of little consequence.